Professors at Yale Law School, Supreme Court nominee Brett Kavanaugh's alma mater, cancelled class on Monday to allow students to protest Kavanaugh's confirmation in light of sexual assault allegations made against him. One professor, James Forman, cancelled his Criminal Law class in an email to his students, writing "I just received a request to cancel class on Monday. 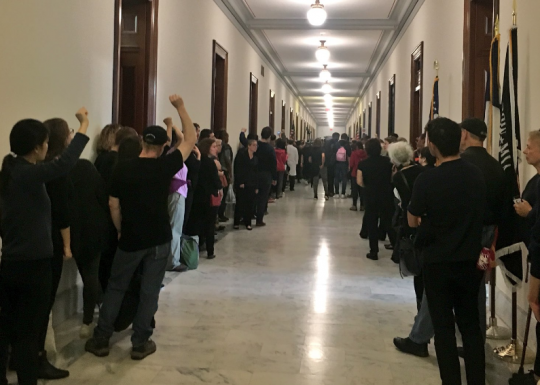 I understand that some students want to go to D.C. to protest or otherwise engage with the Kavanaugh hearings. Criminal Law is cancelled"
"Yale Law School did not cancel all classes," she said. "Many faculty members chose to reschedule or cancel their own classes today. And some held classes as usual." Law & Crime reports that 31 classes were cancelled due to the protests. Yale Law School students and alumni have organized "sit ins" against Kavanaugh's nomination both on Yale's campus and in Washington, D.C.
Forty-nine Yale Law faculty members signed an open letter to the Senate Judiciary Committee calling for Kavanaugh's confirmation to be delayed pending a full investigation. "With so much at stake for the Supreme Court and the nation, we are concerned about a rush to judgment that threatens both the integrity of the process and the public’s confidence in the Court," the letter said. "Some questions are so fundamental to judicial integrity that the Senate cannot rush past them without undermining the public’s confidence in the Court. This is particularly so for an appointment that will yield a deciding vote on women’s rights and myriad other questions of immense consequence in American lives." Yale Law Professor Akhil Amar, who testified in support of Kavanaugh during his confirmation hearing, wrote in an op-ed on Monday that he agreed with his fellow faculty member's sentiments. "These accusations deserve the best and most professional investigation possible — even if that means a brief additional delay on the ultimate vote on Judge Kavanaugh, and even if that investigatory delay imperils his confirmation," he said. Kavanaugh has denied all allegations of sexual assault made against him. President Donald Trump, who nominated Kavanaugh to fill Justice Anthony Kennedy's seat on the Supreme Court, stood by the nominee Monday, declaring the allegations "completely political." This entry was posted in Politics and tagged Brett Kavanaugh, Yale University. Bookmark the permalink.